With mortgage interest rates moving higher over the past few months, are you wondering whether or not to lock in your mortgage interest rate? Well, are you in the window? Some lenders offer the ability of locking in mortgage interest rates to buyers for a period of time. These periods range from weeks to several months. Here's how it basically works. 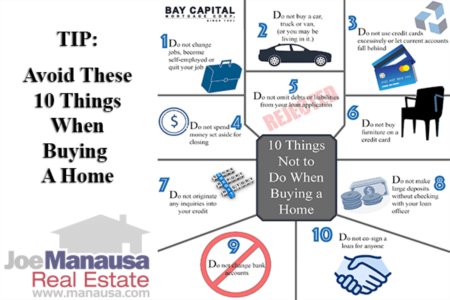 You meet with a reputable lender, complete a loan application and discuss different loan programs and options, and then you start shopping for a home. If you are concerned about rising mortgage interest rates (and today I believe you should be concerned), then you ask your lender for different options for "locking in" your rate. What does this mean? It means the lender quotes you an interest rate, and so long as you close within the time frame and parameters of the loan, you get that rate. Even if mortgage interest rates rise. You effectively "lock" in your rate weeks or months before you actually close on the loan. 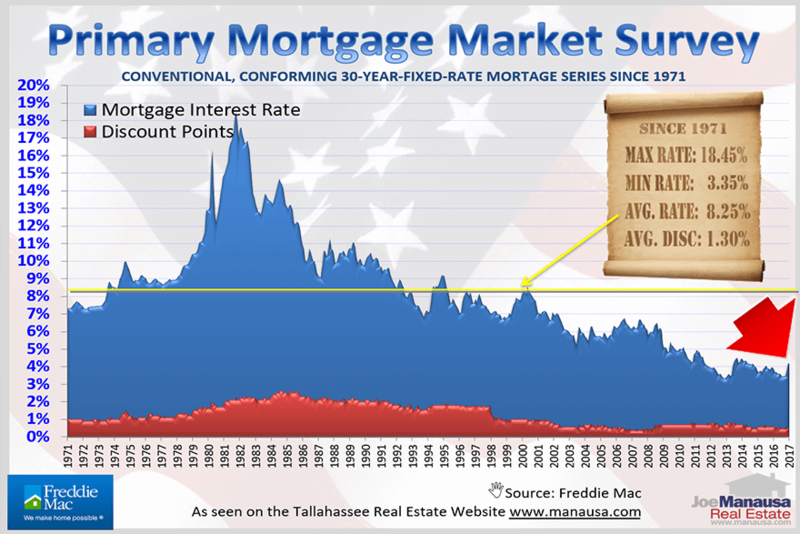 I am not going to tell you that a real estate broker in Tallahassee can forecast the future of mortgage interest rates. But I will tell you that history, both recent and beyond, suggest that rising rates are long overdue. The following graph shows mortgage interest rates for the past 46 years, and it clearly demonstrates that rates have been historically low over the past five years. But it also shows a spike in rates over the past few months. The average rate over the entire graph is 8.25% (roughly double today's rate), and I suspect both a gambler and a mathematician would bet that rates are going to rise. What do you think? If you are in the market to buy a home and are worried about mortgage interest rates rising, then you should discuss a rate lock with your lender and your real estate agent. What does it cost to lock in the rate? Different lenders have different programs, and some programs charge a fee to lock in a rate. If you fail to close you lose the lock-in fee, otherwise, the fee is credited to your normal closing costs (meaning if you close within the lock-in period, it did not cost you anything to lock). For how long is the rate lock valid? - Each lender has individual programs, make sure you understand the duration of the lock-in period. It could be a matter of weeks or months, just ensure you and your real estate agent understand the time frame and plan and contract accordingly. Is it possible to extend the rate lock period? Again, each lender has unique programs, you should make contingency plans for the possibility that you do not make it to closing in time (for example, what happens if there is a title defect found prior to closing and it takes the seller an extra few weeks to close ... pushing you outside of your lock period?). An expert real estate buyer's agent will pair you up with the right lender to ensure that you are offered the best loan program for your home buying situation. There is NOT such thing as one-size-fits-all, we work hard to match the right program to your individual home buying needs. 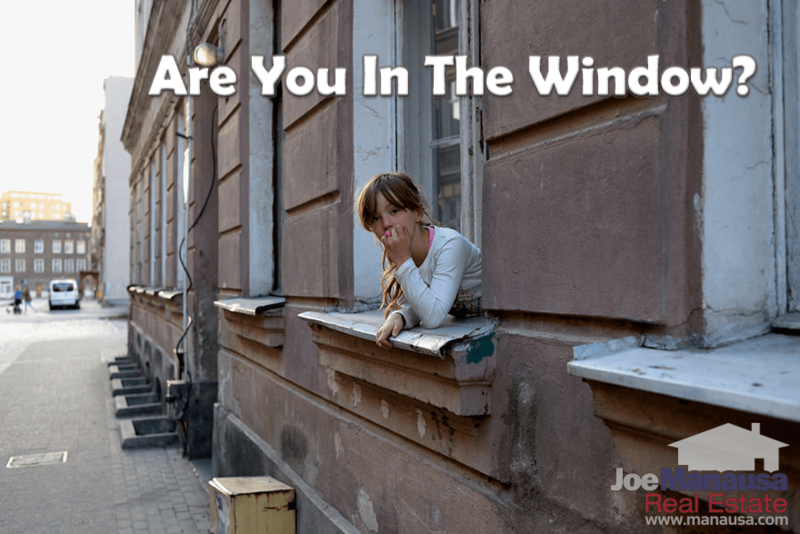 So ... are you "in the window?" If you believe that mortgage interest rates have the potential to rise during your home search, you should establish a window of time to protect yourself against being negatively impacted by the mortgage market. Here is what I mean. Decide (before you shop for homes) upon a closing date and treat it as an immovable suspense date. If you are in no hurry to buy a home, push it forward in time but still "set a date" to close. Then plan your home buying process around that date. 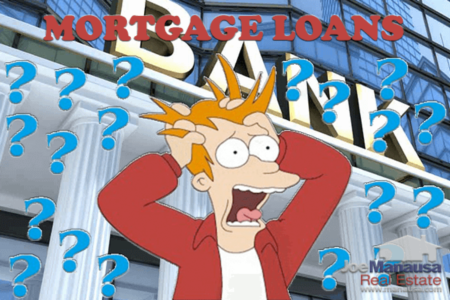 You will want to know different loan options well ahead of the time you find the perfect home. Plan on locking in your mortgage interest rate as soon as you enter the window of time that includes your suspense date for closing. For example, if your lender has a 3-month rate lock, and your suspense date for closing is May 15th, you will want to "lock" your rate with the lender on February 15th and then diligently work to identify a home and get it under contract. Your real estate buyer's agent will help you select a home that is likely to pass all the important inspections so that you do not waste money and your lock-in time on a home that you are not likely to buy. 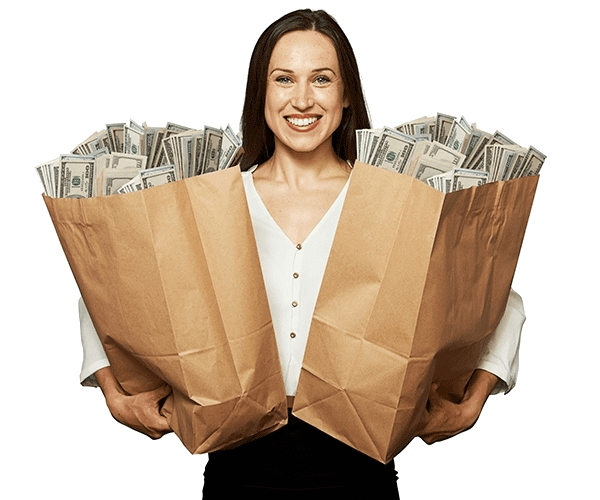 If you are interested in knowing the names of the best lenders in Tallahassee who offer lock and shop types of loans, simply drop me a note and we'll hook you up with somebody who can show you the best programs in town.